Ambubachi Mela is the most important and popular festival at the Kamakhya Temple in Guwahati, Assam. Ambubachi Mela is also known as the Ameti or the Tantric fertility festival and has a close association with the tantric rituals and practices. The door of the Shakti shrine will remain closed from tonight till the 26th June. All the necessary preparations have been made to welcome lakhs of devotees from across the globe to the shrine. The Ambubachi Mela is an annual Hindu mela held at Kamakhya Temple in Guwahati, Assam. It is the celebration of the yearly menstruation course of goddess Kamakhya. It is believed that Devi Kamakhya, the Mother Shakti, goes through her annual cycle of menstruation during this time stretch. There is no idol of the presiding deity but she is worshipped in the form of a yoni-like stone instead over which a natural spring flows. This mela is also known as Ameti or Tantric fertility festival since it is closely associated with Tantric Shakti cult prevalent in eastern parts of India. Even some Tantric Babas make their public appearances only during these four days. The rest of the year, they remain in seclusion. Some Babas are seen displaying their psychic powers like putting their heads in a pit and stand upright on it, standing on one leg for hours at a stretch. The temple remains closed for three days during the mela for it is believed that mother earth becomes unclean for three days like the traditional women's menstrual seclusion. During these three days some restrictions are observed by the devotees like not cooking, not performing puja or reading holy books, no farming etc. After three days devi Kamakhya is bathed and other rituals are performed to ensure that the devi retrieves her purity. Then the doors of the temple are reopened and prasad is distributed. 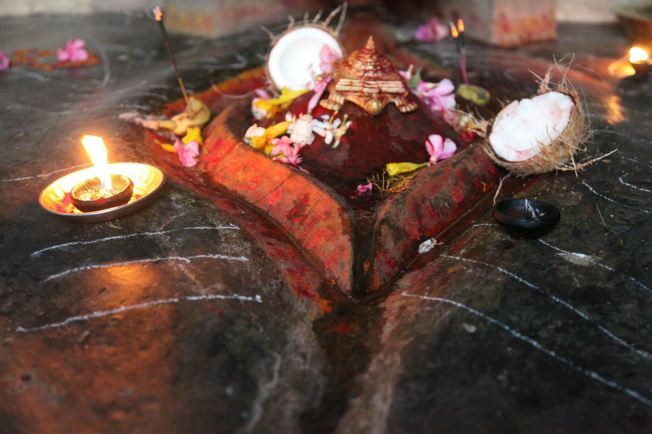 On the fourth day the devotees are allowed to enter the temple and worship devi Kamakhya. Every year lakhs of pilgrims, starting from Sadhus to householders, from all over India, come to Guwahati to observe this festival. They include Sanyasins, black clad Aghoras, the Khade-babas, the Baul or singing minstrels of West Bengal, intellectual and folk Tantriks, Sadhus and Sadhvis with long matted hair etc. Even foreigners from abroad come to seek blessings of mother Kamakhya.